The Cincinnati/Northern Kentucky International Airport (CVG) wanted to improve the experience for the millions of passengers that use the airport every year. The airport implemented an IoT solution to provide its customers with real-time information about the location of its indoor terminal train. By installing and connecting train tunnel sensors to the Losant Enterprise IoT Platform, the airport was able to better inform its customers about how to use the train. The Cincinnati/Northern Kentucky International Airport (CVG) is located 20 minutes outside of downtown Cincinnati and served more than 7.8 million passengers in 2017. The airport offers more nonstop flights than any other airport in the tri-state area of Ohio, Kentucky and Indiana with service to 39 of the top 40 U.S. markets. CVG is recognized globally as a leading U.S. airport by SkyTrax World Airport Award. CVG has been serving commercial passengers since 1947 and is the nation’s eighth-largest cargo airport in North America based on FAA statistics; it is ranked number 34 in the world. Approximately 31,100+ direct and indirect jobs are generated by CVG operations. The indoor train was a common point of confusion for travelers at the Cincinnati/Northern Kentucky International Airport. Travelers didn’t know if they should wait for the train, or walk to the terminal. Additionally, some passengers believed the train would take them into the city although it is only used for terminal-to-terminal transportation. 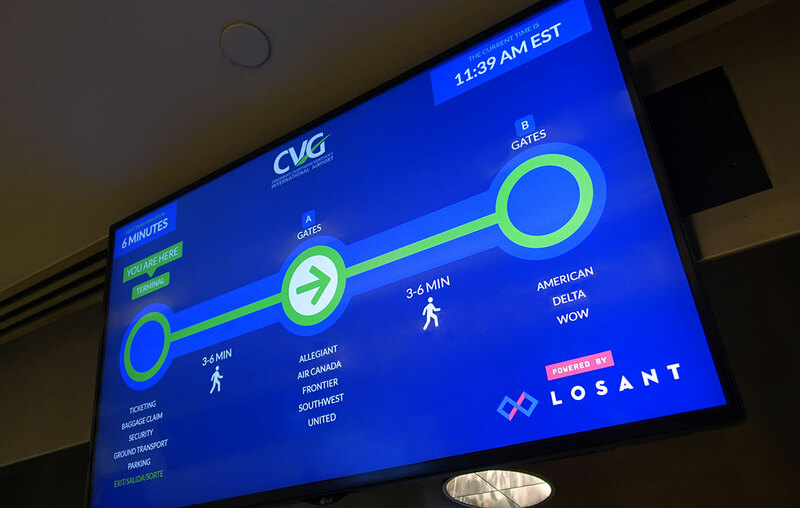 The team at CVG is motivated by a firm belief that a great travel experience should start with an unforgettably positive experience at the airport so the airport’s leadership team embraced the idea that IoT could help with this issue. “We didn’t just jump in with both feet.” Senior Manager of Terminal Operations Stephen Saunders said. The airport set up a proof of concept to determine whether or not the technology was capable of collecting data from the underground tunnel. A small set of Banner Q45 sensors were installed in the train tunnel to deliver information to the Losant Enterprise IoT Platform. Because connectivity is a critical part of getting the information from those sensors, the team also installed gateways in the airport to deliver information over its existing cellular network. After gaining information from the PoC, the airport worked with its facilities department to move into production. Aviation is connecting people in ways we’ve never seen before … passenger traffic is way up and the airports aren’t getting any bigger. We have to get smarter with what we have. … and we’re trying to solve that with technology. Large monitors outside of each train boarding station feature a user-friendly dashboard with estimated walking time, real-time train location, and wait times powered by data from the IoT. Travelers are now informed about how to make the best decision. According to Stephen Saunders, Senior Manager of Terminal Operations, the airport will continue to innovate through pilot projects with startups and problem-solving technologies. The airport would like to continue to gather information about when people get to airports to better help TSA schedules and improve waiting times.